In a clever marketing move, Tableau have just released a new free version of their tool called Tableau Public. 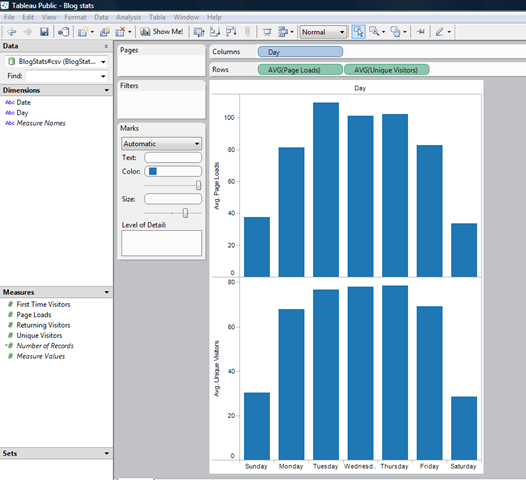 I’ve been a fan of Tableau since I saw it a while back (was it really 2005?) but never seen it actually used at one of my customers, I suppose because of its hefty price. Anyway, what Tableau have done is created a basic version which can only connect to Access, Excel and Text files and can only save to Tableau’s own web gallery; however, it’s then possible to embed the visualisations you create in your own website/blog etc for sharing with the world. The stated aim is for this site to be the YouTube of data visualisation; coming from Tableau this is a half-credible claim because they really do understand this area and have some great tools. Also, I’m sure the extra publicity it will generate for the company will do no harm for sales of the paid version either. And I’m sure it will be great when they get over their teething difficulties, because at the time of writing I can’t actually save anything… maybe they underestimated the amount of interest this would generate? So Tuesday is the best day for page loads, but Thursday is slightly better for unique visitors… and so on. But it’s a cool tool and definitely worth checking out.